The McWatters Collection of wines that I’ve tasted have always been top quality. I reviewed the McWatters Collection Meritage 2013, and now the 2016 release. It is quite interesting to me to see the similarities between both wines. 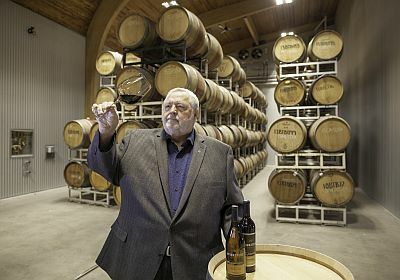 Harry McWatters only produces two wines under this label; his red Meritage, which is always based on Cabernet Sauvignon, and a Chardonnay. Both are meant to be bold, just like Harry. We can all enjoy a single instrumental piece, such as by guitar or piano (or a single varietal wine), but a symphony is composed of different instruments with different tones and intensity of volume, but all blend together to make something of far grander proportions (like a Meritage). Let me tell you about the 2016 Meritage which I received to taste and review. 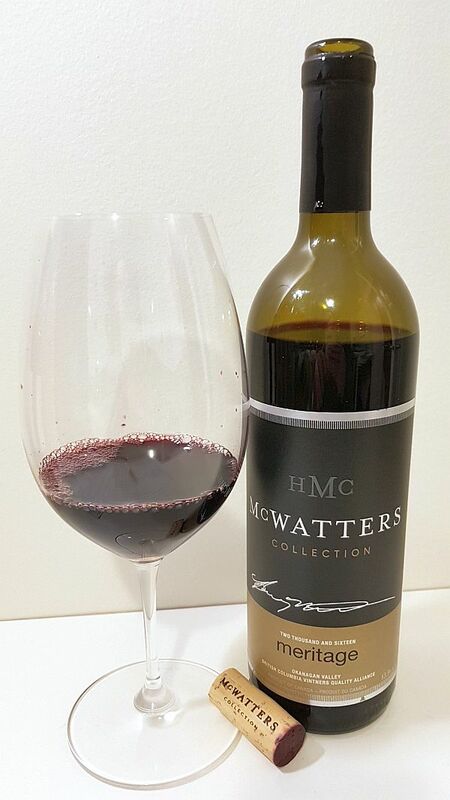 McWatters Collection Meritage 2016 ($29.99) – The grapes in this blend are 50% Cabernet Sauvignon, 35% Merlot, and 15% Cabernet Franc and were matured in small French oak casks for 15 months. The wine is opaque garnet, almost to the rim. It has a youthful, medium intensity nose, with a mix of capsicum, dark chocolate, ripe plums, dark fruits, and hints of sweet spice, oak, and vanilla. With a little air I was quite surprised, but very much enjoyed, an aroma of mandarin orange peel on the nose. The wine is dry, with a full mouthfeel, and was exceptionally velvety smooth. Fine tannins with a hint of minerality. Flavours combined sweet ripe black fruit (more), red fruit (less), and plum, with a light touch of vanilla and oak. From the mid-palate to the finish I also enjoyed the flavour of dark chocolate combined with black cherries. With decanting I picked up some cedar and capsicum flavours, while the mineral component diminished. The wine finished with dark fruits, dark chocolate and cherries, along with medium oak and some pepperiness. The tannins picked up on the finish, and with decanting made the finish more grippy. A quality wine! I think that this wine tasted better without decanting, so open and enjoy it through your meal. Rating: – A top quality wine that entices you to enjoy its velvety full-bodied black fruit flavours. You can purchase McWatters Collections wines through this link.